The U.S. stock market has traditionally been more volatile in October than any other month and is also known for some major crashes. Even though it is typically a rough month for major bourses, it is mostly positive in midterm election years. Some analysts cautioned that a more hawkish Fed and ongoing trade conflicts might slow the nine-year rally this month. However, most of the analysts agree that the general economic outlook is bright and will offset any concern. By the way, the United States and Canada recently confirmed a “new modernized trade agreement,” which should fuel the stock market rally further. Given the positives, investing in solid stocks that can make the most of this resilient October seems prudent. Astute investors pay special attention to the ‘October Effect’. The theory states that stocks mainly decline in October. After all, some of the worst market crashes happened in this month. According to the Stock Trader’s Almanac, there were mega “crashes in 1929 and 1987.” In fact, the great crash that occurred on Oct 19, 1987 saw the Dow plunge 22.6% in a single day, which is arguably the worst one-day decline ever. The other black days, of course, were “the 554-point drop on October 27, 1997, back-to-back massacres in 1978 and 1979, Friday the 13th in 1989, and the meltdown in 2008,” per the Almanac. However, the “October Effect” phenomenon does seem overrated. September has seen more declines than October. And from a historical perspective, October has seen the end of more bear markets than any other month. Thus, October is a month suitable for contrarian buying. At the same time, October has been relatively stronger during midterm election years, with 2018 being one such year. According to Almanac, the Dow normally rises an average 0.6% in October and 3.1% in midterm election years. Similarly, the broader S&P 500 usually climbs 3.3% in midterm Octobers, way more than its typical rise of 0.9% over the month. A Topsy-Turvy Ride This Month? Not Really! Traditionally, October has experienced well-above-average gyration. For instance, the standard deviation of the Dow’s daily changes has been 1.44% for all Octobers since 1896, much more than 1.05% for all months other than October, per Bespoke Investment Group. And if you believe that the Dow’s fluctuation is mostly because of the 1987 crash or 2008 financial crisis, you are mistaken. Even if these two years are not taken into consideration, the standard deviation of daily Dow changes is still higher in October compared to other months. But, let’s admit that investors heading into October have been a lot calmer. The Cboe Volatility Index tanked more than 19% in the third quarter, its steepest quarterly decline since the first quarter of 2016. Meanwhi;e, the third quarter represented one of the strongest quarters for Wall Street in years. The S&P 500, in particular, registered its biggest quarterly advance since the fourth quarter of 2013. After a nine-year rally, sceptics are inquisitive about how farther the bull run will go, especially this month. They say that the Fed’s interest rate hike and U.S. trade disputes might be big road bumps. After all, the soon-to-expire accommodative monetary policy did help markets chug along, while trade-related issues might hamper economic growth and corporate profits. However, most investors time and again choose to ignore such issues. They rather believe that robust economic growth and upbeat corporate earnings will keep the bull market intact. Most of the components of the Conference Board’s Leading Economic Index indicated a 3% or more growth rate in GDP in the final two quarters of the year and is on track to hit the Trump administration’s annual growth target of 3%. If that happens, it would be the best yearly performance since 2005, two years before the Great Recession. The economy has expanded at a seasonally adjusted rate of 4.2% in the April-June quarter, per the Commerce Department. This marked the strongest rise since a 4.3% annual gain recorded in the third quarter of 2014. And when it comes to corporate earnings, Q2 growth has been the highest since 2010, while growth in Q3 is expected to be in double-digits for the sixth time in the last seven quarters (read more: Looking Ahead to Q3 Earnings Season). In fact, investors are getting optimistic about U.S. stocks, largely because of the encouraging outlook for corporate profits. Per the latest monthly survey of fund managers by Bank of America Merrill Lynch, there is a net allocation of 21% overweight to the U.S. equity market, the highest since January 2015. The survey also figured out that a net 69% of those polled said that the United States is the most sorted region when it comes to earnings expectations. With October all set to dispel the darkness of its past, investing in fundamentally sound stocks that are poised to gain in the near term seems judicious. 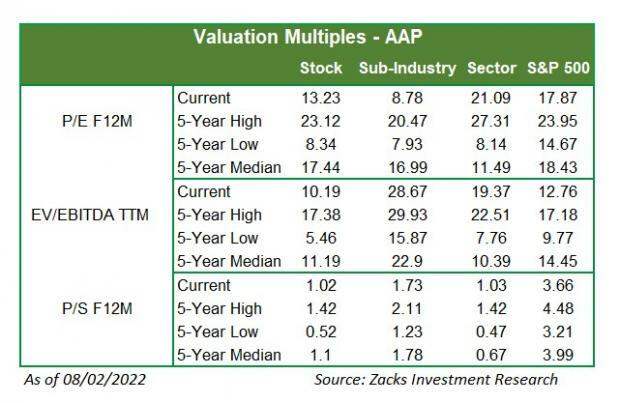 We have selected five such stocks that flaunt a Zacks Rank #1 (Strong Buy). Such stocks also boast of a VGM Score of A or B. Here V stands for Value, G for Growth and M for Momentum and the score is a weighted combination of these three metrics. Such a score allows you to eliminate the negative aspects of stocks and select winners. Advance Auto Parts, Inc. AAP provides automotive replacement parts, batteries, accessories, and maintenance items for domestic and imported cars, vans, sport utility vehicles, and light and heavy duty trucks. The company currently has a VGM Score B. In the last 60 days, 10 earnings estimates moved north, while none moved south for the current year. The Zacks Consensus Estimate for earnings rose 2.4% in the same period. The company’s expected earnings growth rate for the current year is 29.6% compared with the Automotive – Retail and Wholesale – Parts industry’s estimated rally of 19.4%. The stock has outperformed the broader industry so far this year (+68.8% vs +28.7%). Guess’, Inc. GES designs, markets, distributes, and licenses lifestyle collections of apparel and accessories for men, women, and children. The company currently has a VGM Score A. In the last 60 days, three earnings estimates moved north, while none moved south for the current year. The Zacks Consensus Estimate for earnings rose almost 3% in the same period. The company’s expected earnings growth rate for the current year is 48.6% compared with the Textile – Apparel industry’s estimated rally of 16%. The stock has outperformed the broader industry on a year-to-date basis (+33.9% vs +28%). Tilly’s, Inc. TLYS retails casual apparel, footwear, and accessories for young men and women, and boys and girls in the United States. The company currently has a VGM Score A. In the last 60 days, three earnings estimates moved north, while none moved south for the current year. The Zacks Consensus Estimate for earnings rose 11.1% in the same period. The company’s expected earnings growth rate for the current year is 38.5% compared with the Retail – Apparel and Shoes industry’s estimated rally of 13%. The stock has outperformed the broader industry so far this year (+28.4% vs +4.7%). You can see the complete list of today’s Zacks #1 Rank stocks here. UFP Technologies, Inc. UFPT designs and converts foams, plastics, composites, and natural fibre materials for the medical, automotive, consumer, electronics, industrial, and aerospace and defence markets in the United States. The company currently has a VGM Score B. In the last 60 days, one earnings estimate moved up, while none moved down for the current year. The Zacks Consensus Estimate for earnings rose 4.8% in the same period. The company’s expected earnings growth rate for the current year is 56% compared with the Containers – Paper and Packaging industry’s projected rally of 24.3%. The stock has outperformed the broader industry on a year-to-date basis (+32.2% vs -5.7%). Cleveland-Cliffs Inc. CLF operates as an iron ore mining company in the United States. The company currently has a VGM Score A. In the last 60 days, two earnings estimates moved north, while none moved south for the current year. The Zacks Consensus Estimate for earnings rose 2.9% in the same period. The company’s expected earnings growth rate for the current year is 250% compared with the Mining – Miscellaneous industry’s estimated rally of 6.2%. The stock has outperformed the broader industry so far this year (+75.6% vs -3.1%).